Pay Gaps in Education are Bad. Pensions Make Them Worse. Education, as a field, isn’t supposed to have pay gaps. In the vast majority of school districts, salaries are determined by uniform salary schedules based on educators’ years of experience and educational attainment. This policy should, at least in theory, guard against gender- or race-based salary inequities. Sadly, pay gaps persist. In a new report, we studied Illinois’ educator data and found that women, regardless of experience level, earn markedly lower salaries than their male peers. 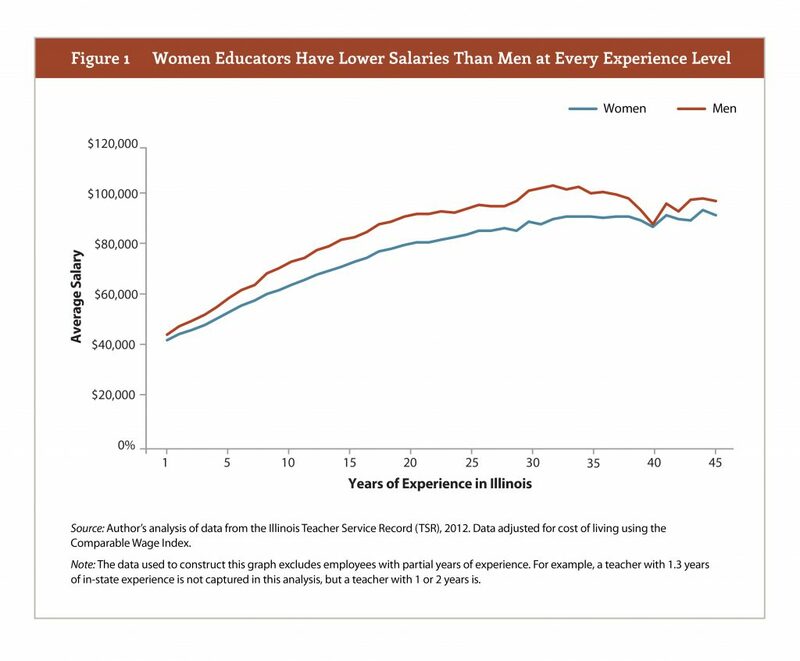 As shown in the graph below, gender-based salary gaps begin in educators’ first year and increase until an educator reaches her 30th year of service. As we show in the paper, these gaps also persist into retirement. For example, a teacher first becomes eligible for a pension after working for ten years in Illinois. At that point in their career, women’s average salary is $8,000 less than their male colleagues. This salary gap translates in a $2,100 disparity in annual pension benefits. And that pension inequity continues to grow each year. After working 30 years, a common retirement age, male educators get an average pension that is $8,000 more valuable than the average pension women receive. That is $8,000 less per year. After 10 years in retirement, men will have amassed an additional $80,000 in retirement benefits. In short, salary schedules fail to sufficiently guard the education field against large and persistent gaps in salary and retirement benefits. To learn more about gender-and race-based inequities in salaries and pensions, read the full report, here. This entry was posted in Equity, Teacher Pensions and tagged equity, Teacher Pensions, teacher salaries on March 13, 2018 by Max Marchitello. Money spent on public teacher pensions is often left out of analyses of school finance equity. Rather than a being seen as an issue affecting students’ education, pensions are often viewed as a budgetary dilemma for state legislators. Yet, both of these approaches overlook the effect pension spending can have on increasing the funding gap between schools based on students’ race. 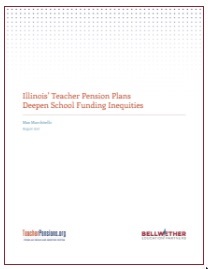 Last week I released a new report, “Illinois’ Teacher Pension Plans Deepen School Funding Inequities,” that shows just how much pension spending in Illinois affects the state’s finance equity. The results are startling and reveal that teacher pensions are yet another example of how states and districts underinvest in the education of low-income students, and the educations of black and Hispanic students. Class-based gaps grow by more than 200 percent after accounting for pension spending. Teacher salaries comprise the lion’s share (roughly 80 percent) of school expenditures. And, unfortunately, the most experienced and highest paid teachers are unevenly distributed across schools. In Illinois the salary gap between the schools serving the highest and lowest concentrations of low-income students is on average around $550 per pupil. After factoring in pensions, however, the disparity jumps to over $1,200 per student. Race-based gaps increase by more than 250 percent after accounting for pension spending. In Illinois, the average teacher salary-based gap is $375 between schools serving predominantly white students and those serving predominantly nonwhite students. But after accounting for money spent on teacher pensions, the inequity increases to nearly $950 per pupil. States are investing more money in their pensions (because they’re in significant debt), and that will widen the gaps even further. From an educational equity point of view, the Illinois pension system is the problem. Since pensions are paid as a percentage of teachers’ salaries, which are unevenly distributed across the state, funneling more money into the system may help to decrease unfunded liabilities, but it also will result in even larger funding disparities. Illinois is widely considered to operate one of, if not the most, inequitable school finance systems in the country. Yet, many prior analyses underestimated the problem because they have not always included money spent on teacher pensions. This problem is not unique to Illinois. On the contrary, pensions will increase funding disparities in any state with an uneven distribution of teachers. The effect will likely be greater and more closely resemble Illinois in states, such as Missouri and New York, where large urban cities operate separate pension funds. There are a couple of steps states can take to mitigate the increase in education funding disparities due to pension spending. Those states with more than one retirement system should consider folding the district plans into the state fund. The state has greater resources and almost always contributes to the pension fund at a higher rate. This would ensure that schools in the district — which disproportionately serve low-income students and students of color — receive pension payments at the same rate as other schools. As it stands now, low-income students and students of color receive far less than their fair share in school funding. To change that, states must address the structure of their teacher pension systems as well as their school funding formulas. Teacher pensions are a key feature in the broader education equity debate. This entry was posted in Equity, School Funding, State Education Policy, Teacher Pensions and tagged equity, state education policy, Teacher Pensions on August 29, 2017 by Max Marchitello. 1. Because pensions are so back-loaded, teachers only really benefit after they stay for a VERY long time, often 25 or 30 years. After the Orleans Parish School Board dismissed 7,500 employees in the wake of Hurricane Katrina, they significantly altered their teaching workforce. 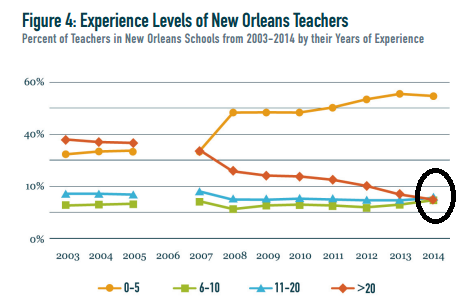 Today, almost no New Orleans teachers have 20 or more years of experience, meaning very few teachers are truly benefiting from the state pension system. The graph below comes from a new brief out of the Education Research Alliance for New Orleans. The red line represents the percentage of New Orleans teachers with more than 20 years of experience. It plummeted after Hurricane Katrina, and today only about 7-8 percent of New Orleans teachers have 20 or more years of experience. Other than this small fraction of workers, New Orleans teachers are enrolled in a retirement system that won’t provide them sufficient retirement income. 2. Louisiana teachers are part of the 40 percent of American public school teachers who are NOT enrolled in Social Security. Not only are they losing out from their pension system, they also can’t count on Social Security to provide them income protection in their old age as nearly every other American worker does. We think they should be. This entry was posted in Teacher Pensions and tagged Hurricane Katrina, New Orleans, Teacher Pensions on August 25, 2015 by Chad Aldeman.